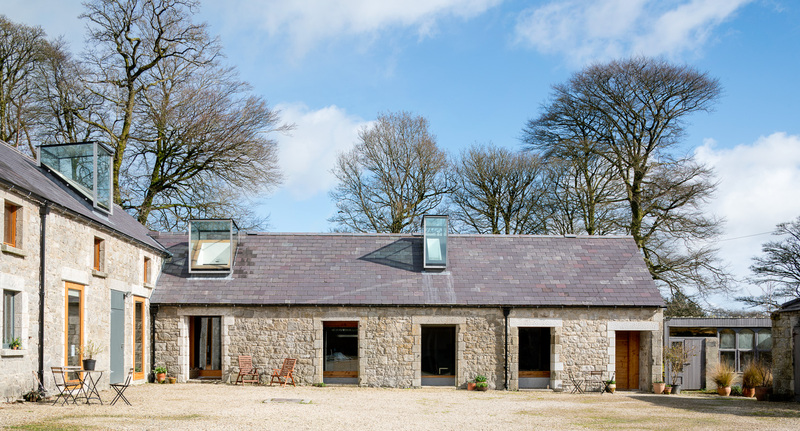 The Turkey House is a recently restored farm building set in the grounds of the garden and is available to rent as a 2 bedroom holiday house. 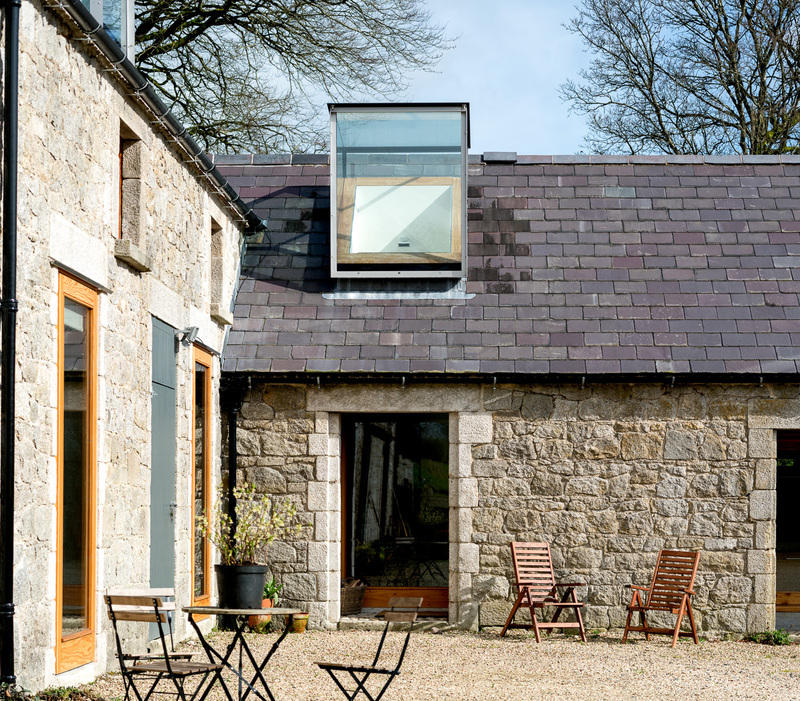 Several years ago four projects were imagined within Tinode House's virtually derelict nineteenth century farmyard buildings. 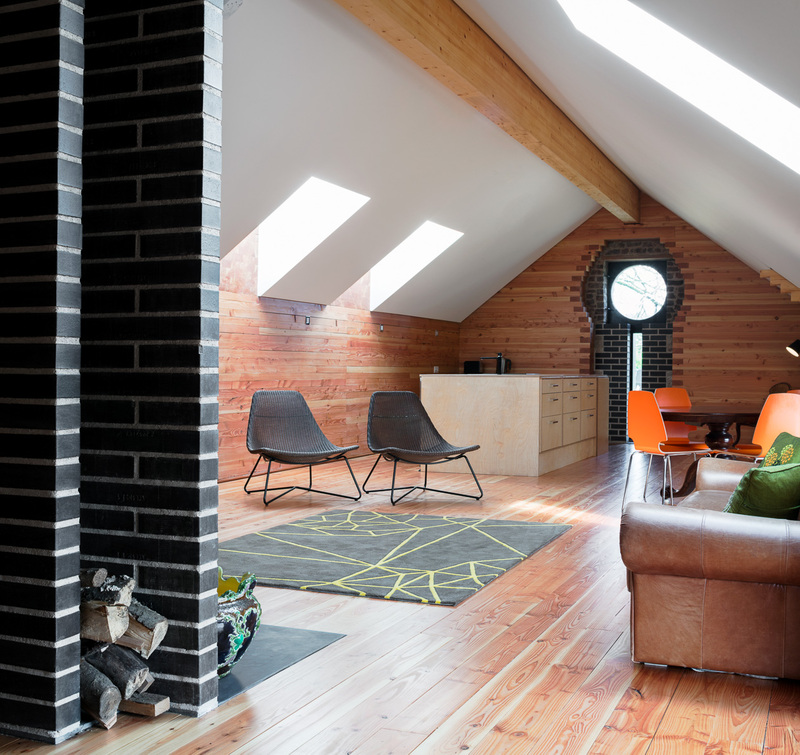 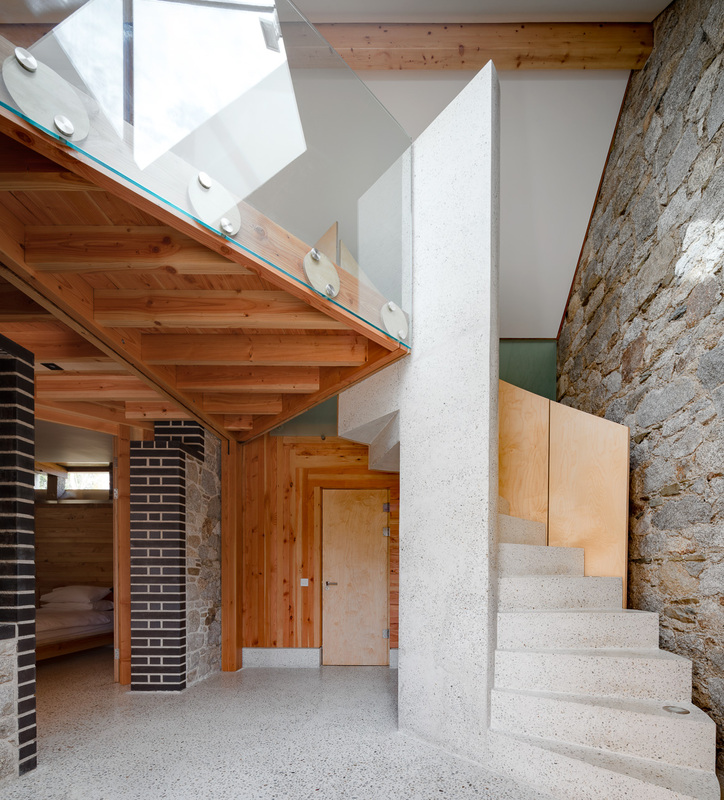 The first to be constructed was The Cow House which was selected as the RIAI Best House in its' 2014 Awards. 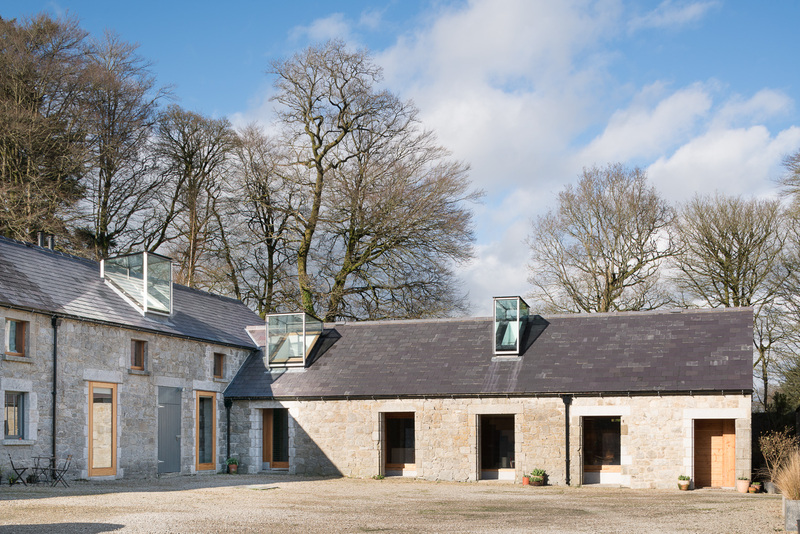 The second was completed in 2016 and is called The Turkey House as turkeys were raised in what had formerly been the stables. 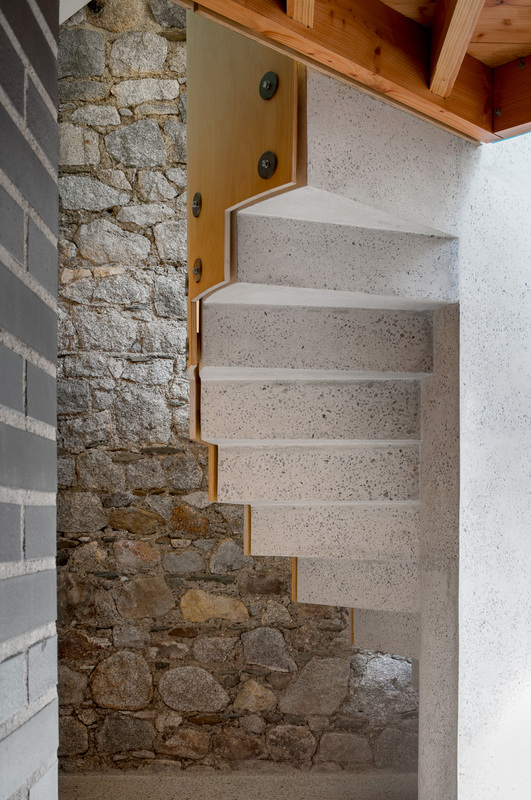 The double height entrance hall has a dramatic cast concrete stairs which leads to the living accommodation on the first floor. 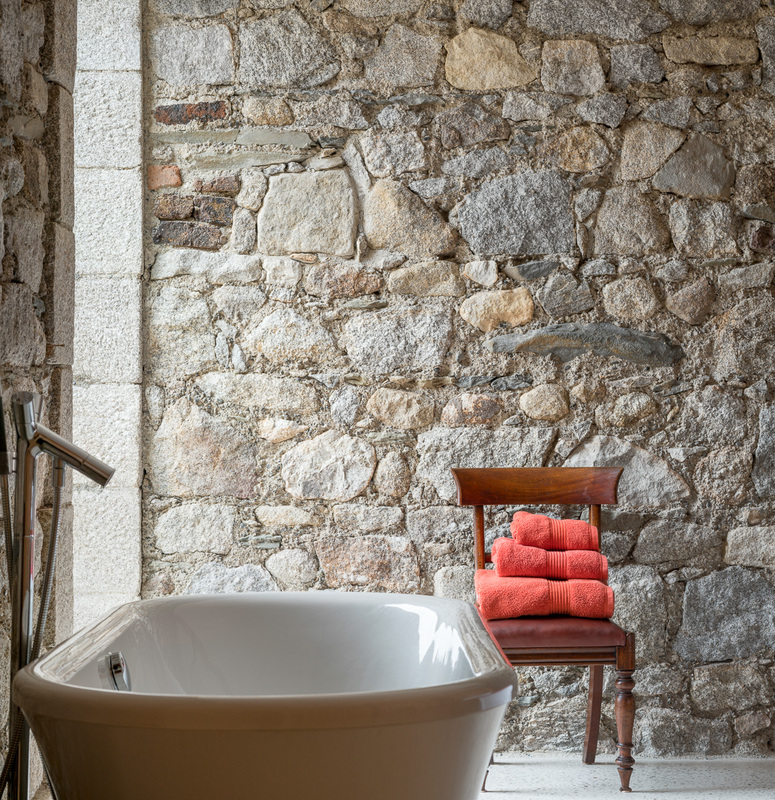 The main shower room which is extensively lined with white glass and floored with black stone mosaic is located here. 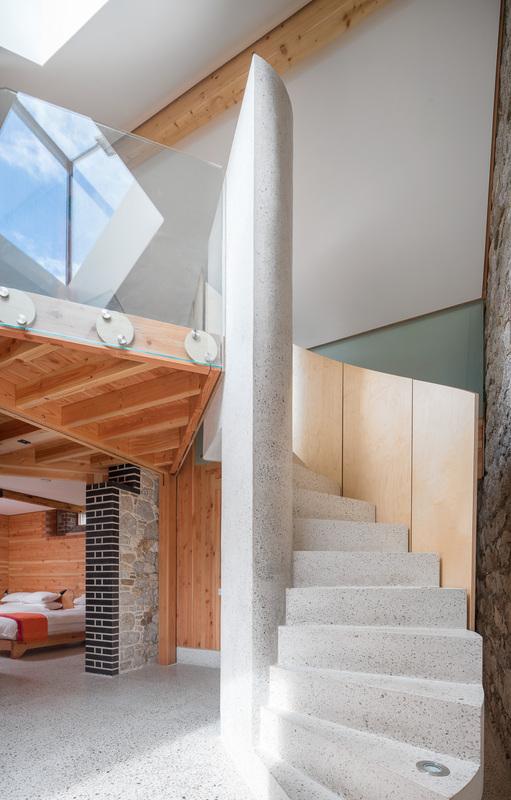 Elsewhere floors are polished cast concrete made with local granite sand and aggregate and white cement. 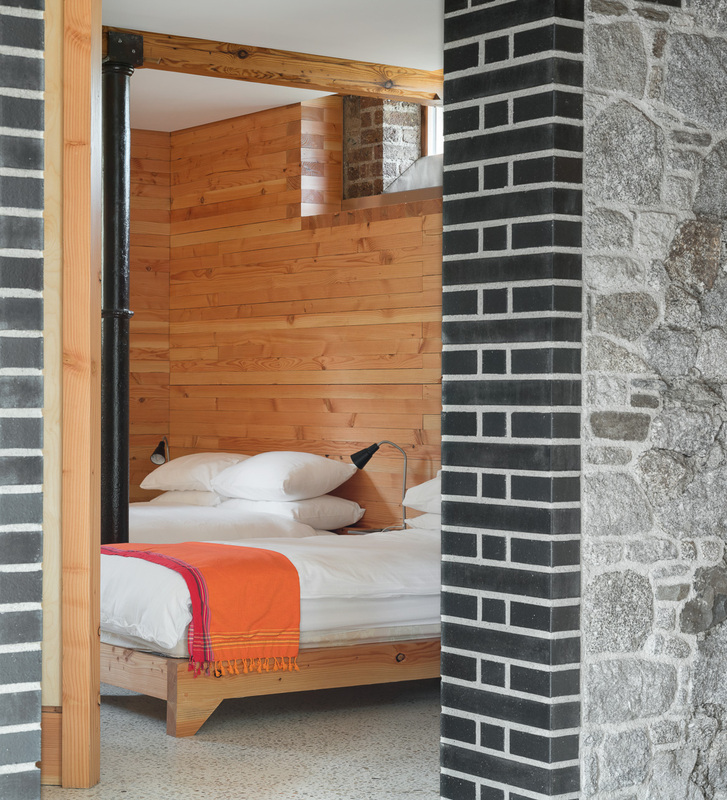 Openings formed in original granite walls to facilitate the new layout are trimmed with blue brickwork. 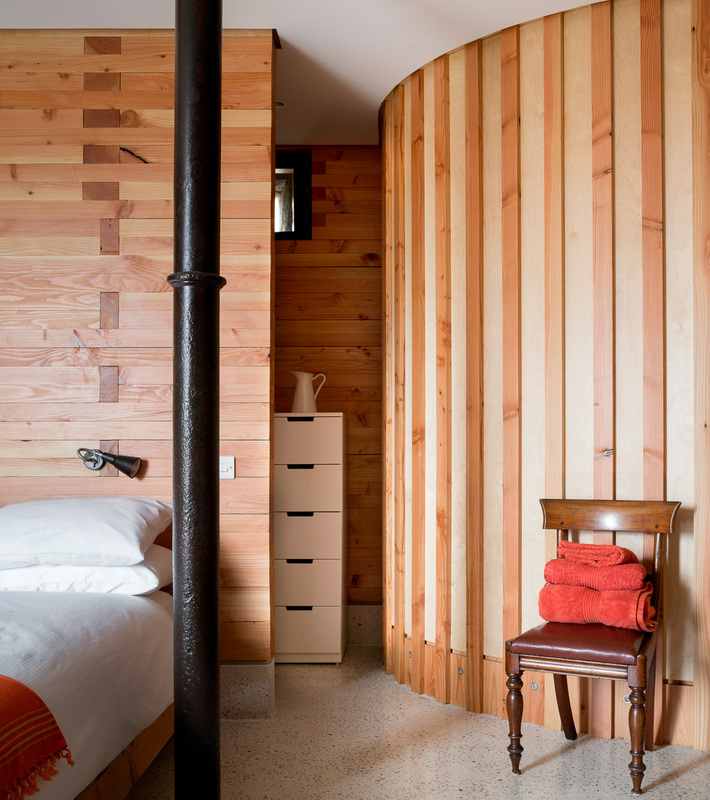 The former stables at ground level have been subdivided by a new 'spine wall'-a curving partition made of Douglas Fir and plywood. 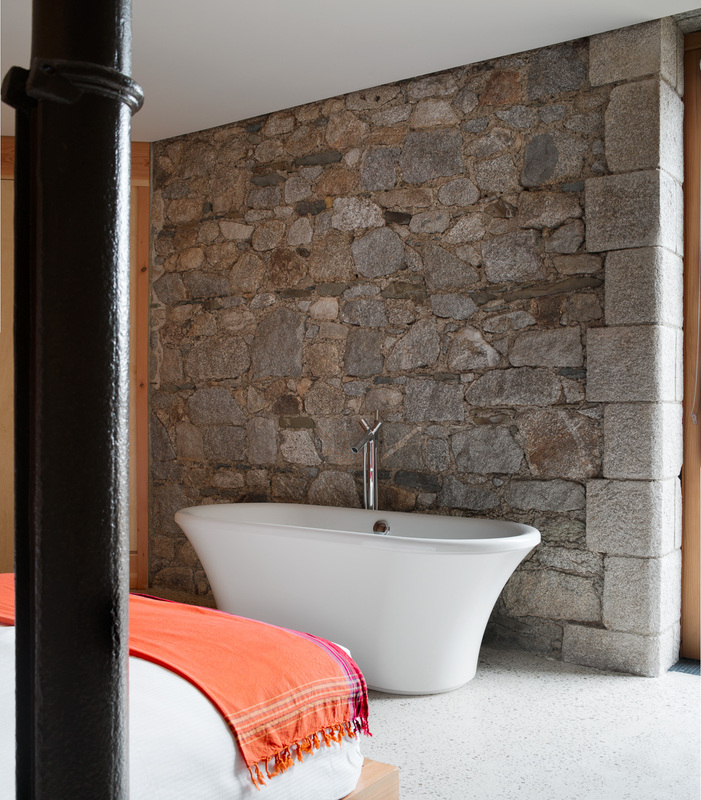 The larger bedroom has an en-suite shower room which is extensively lined with white glass and floored with black stone mosaic. 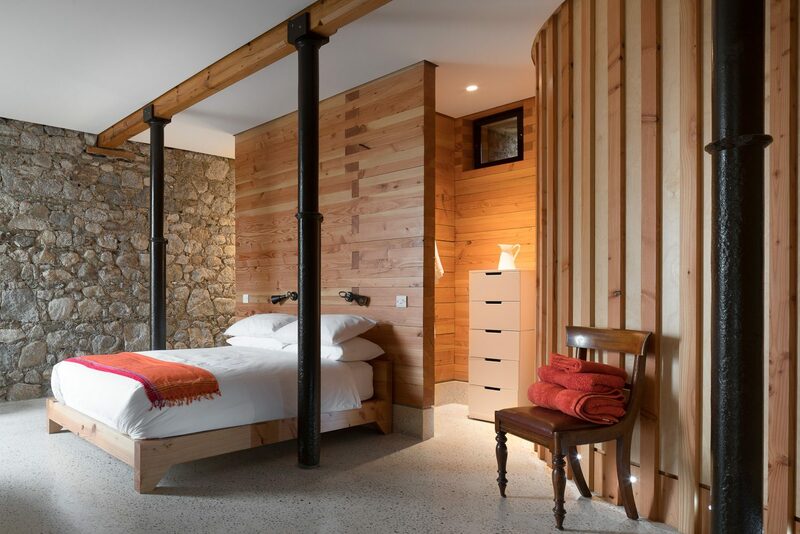 It is furnished with a double bed, a recessed storage closet and a free standing bath. 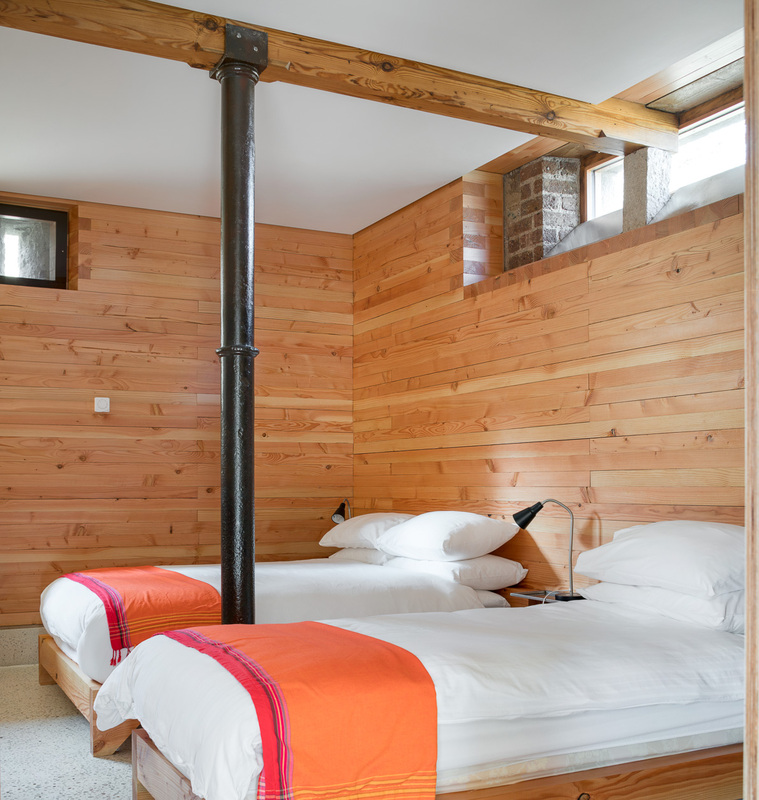 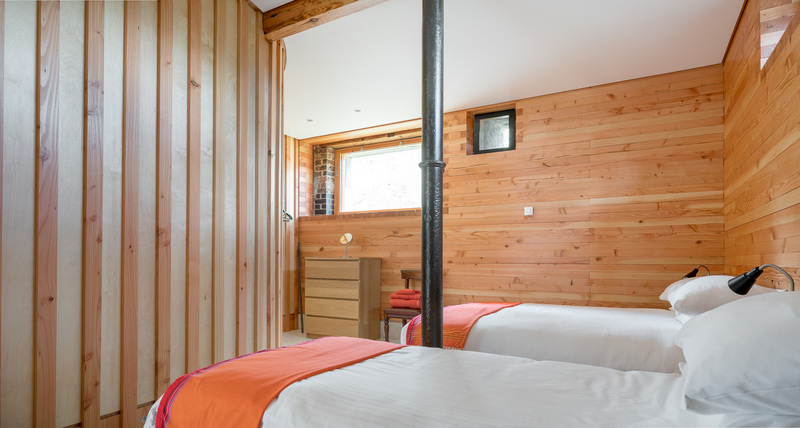 The smaller bedroom is furnished with a double and a single bed. 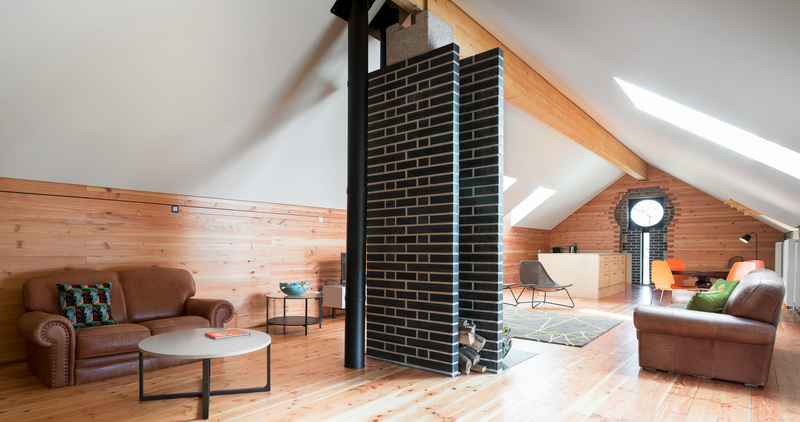 The living accommodation is located at first floor level is one large open space that accommodates the kitchen, dining and sitting room functions. 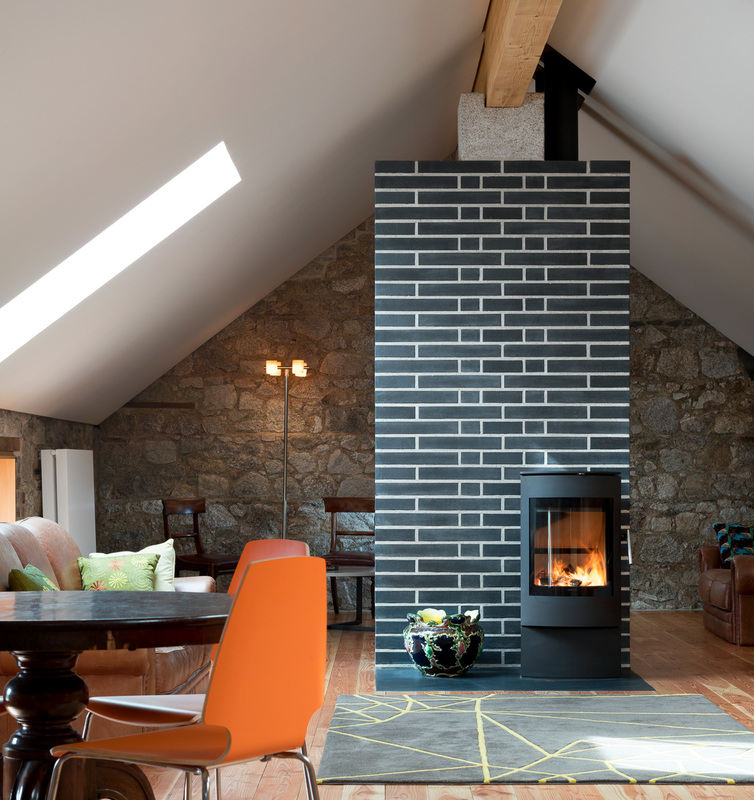 A new blue brick wall element has been inserted which functions as a space divider, a back panel for the wood burning stove and a structural element. 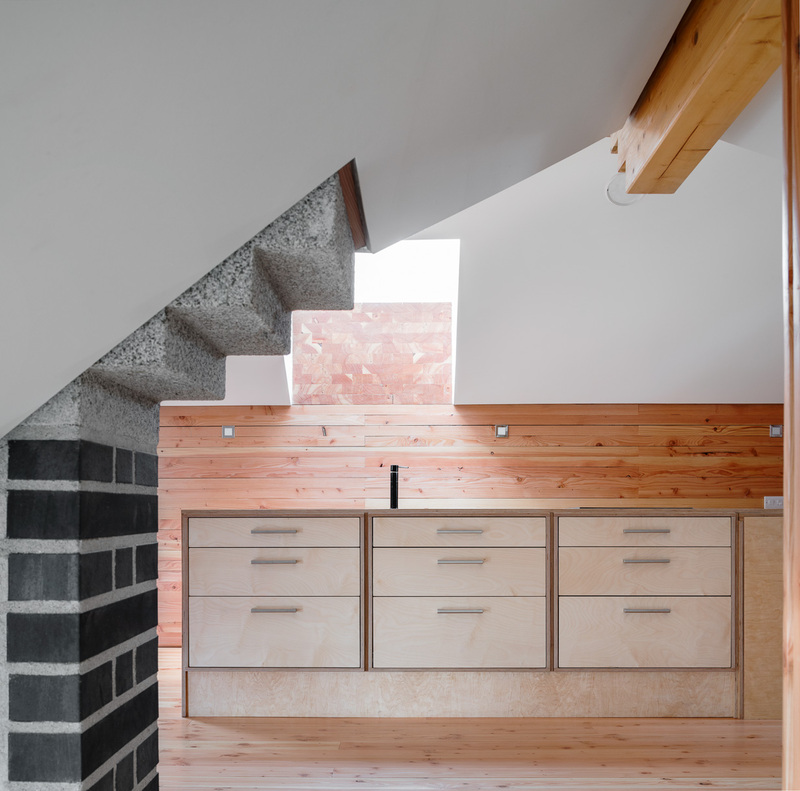 It supports the laminated timber ridge beam which spans the length of the space. 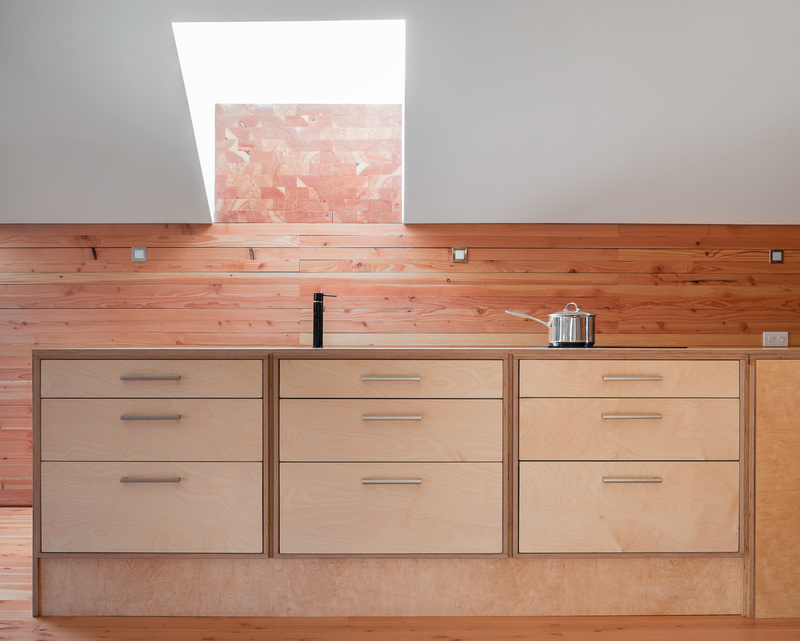 One stainless steel framed and double glazed lantern and two roof lights light the space. 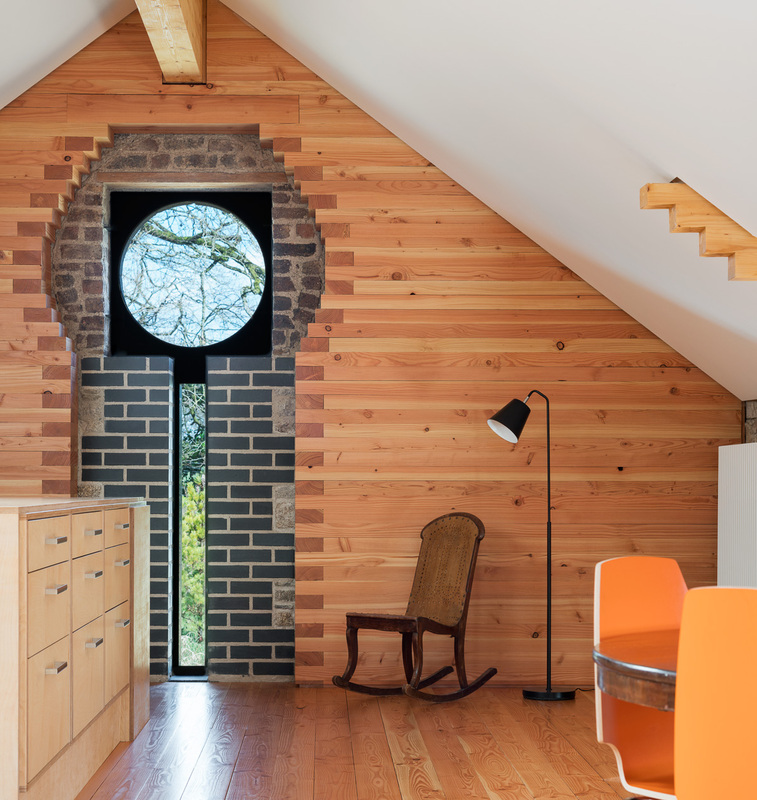 The circular gable window had been extensively altered to form a direct access from the outside. 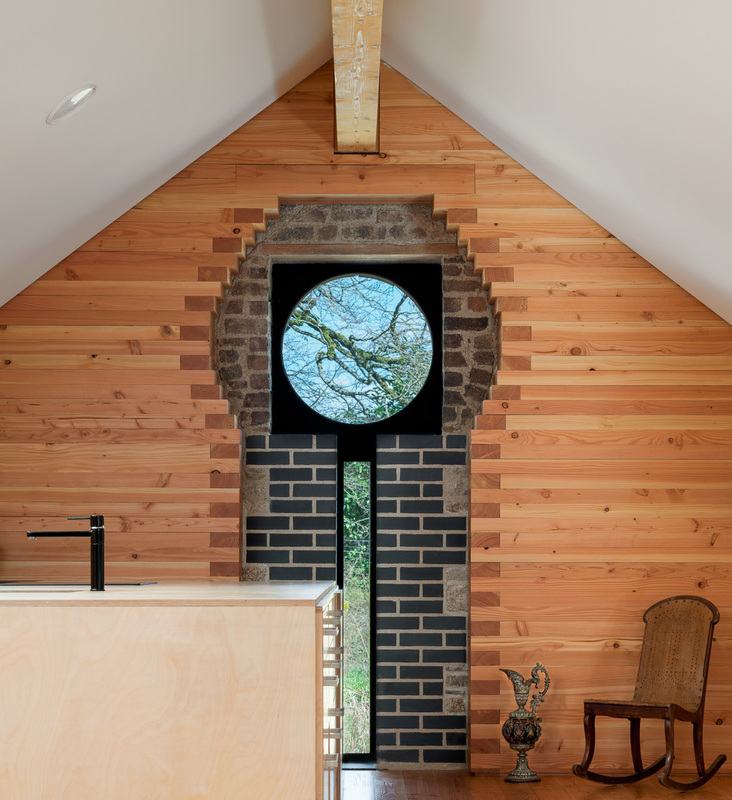 It has been substantially reformed but now as a 'key hole' window. 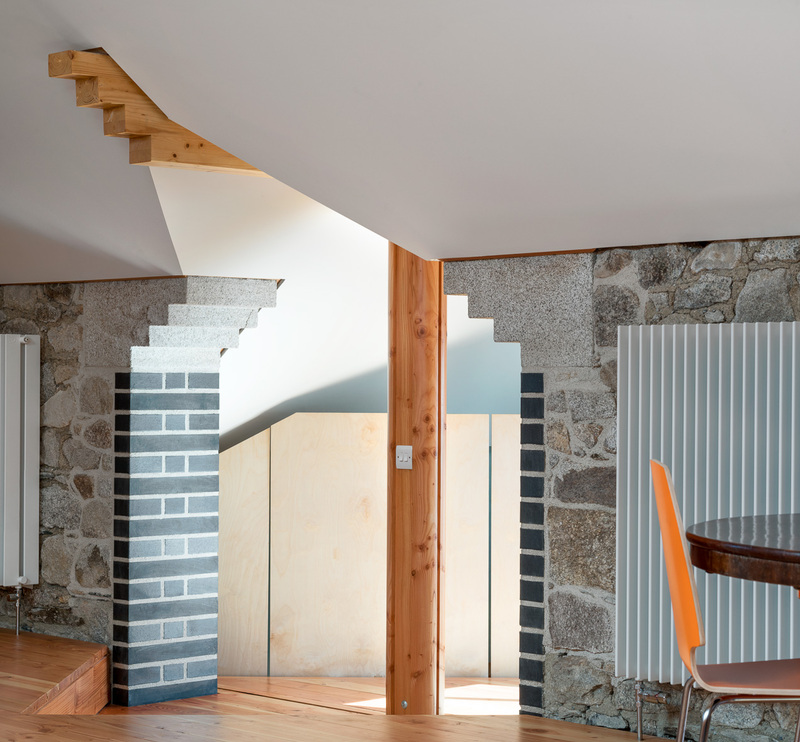 Blue brickwork clarifies the latest alteration of original granite walling. 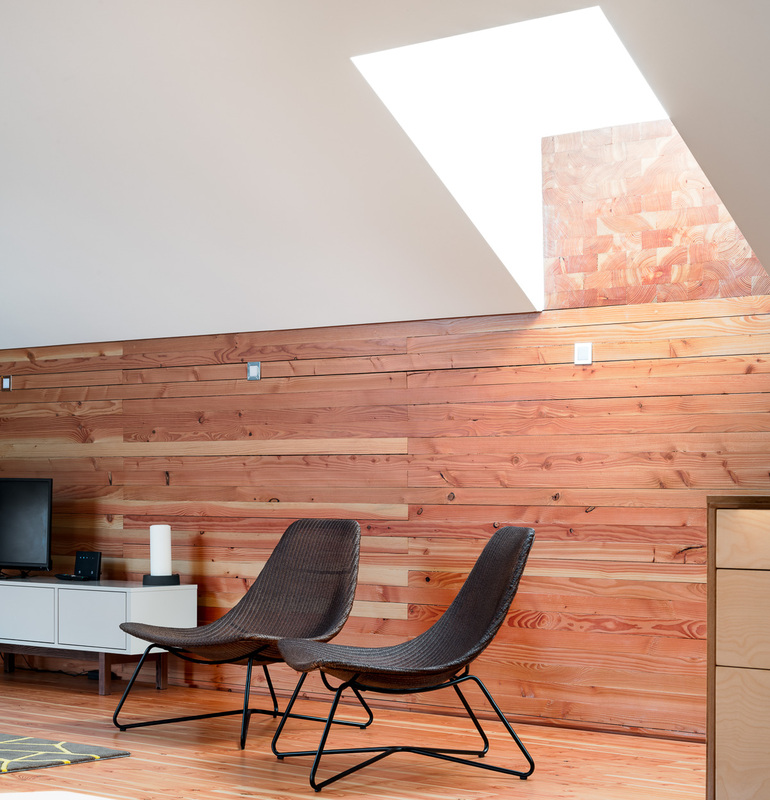 The floor is made of Douglas Fir. 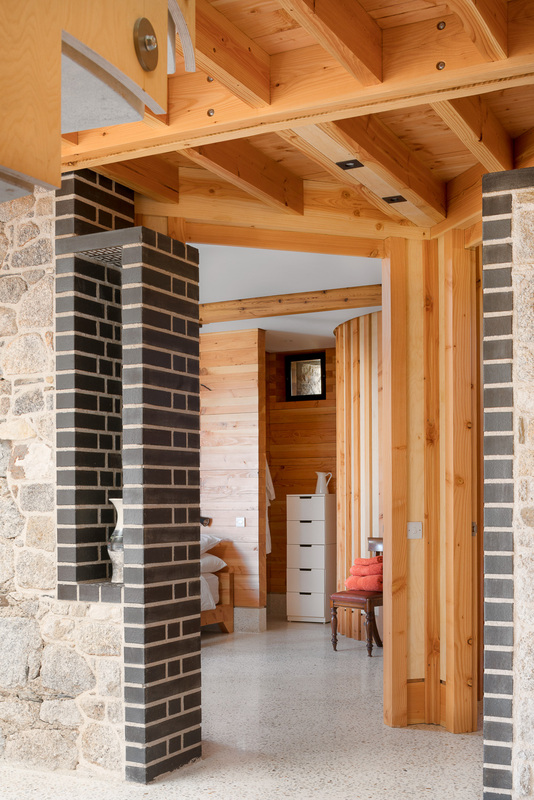 The existing granite walls on the north and east sides were lined internally at both levels with 144mm wide stacked Douglas Fir sections, with 40mm insulation and a 30mm cavity. 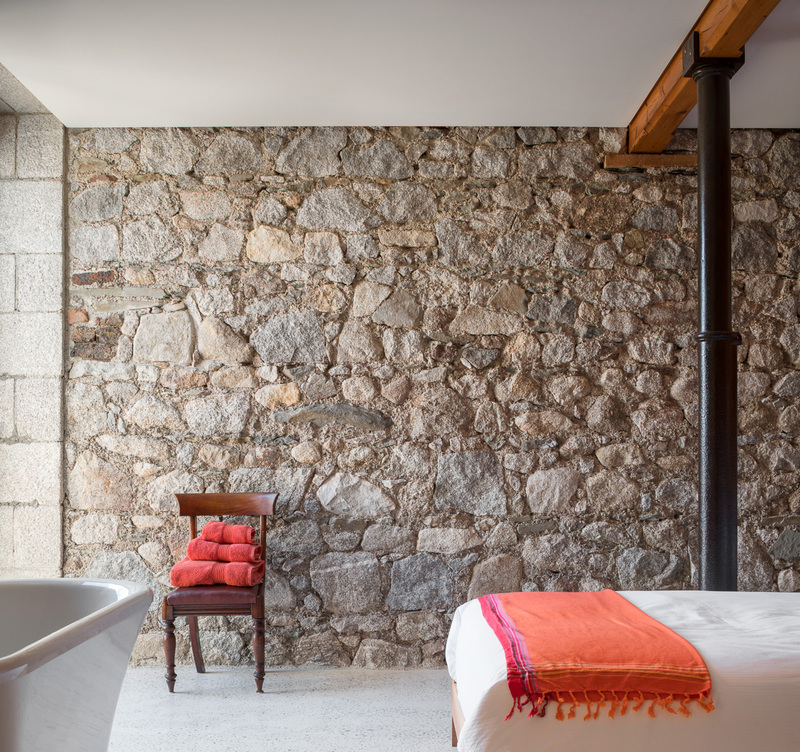 The remaining granite walls have been grit blasted and left essentially as found.